About: Maroush is a chain of upmarket Lebanese restaurants with authentic atmospheres that serve traditional dishes. They also offer a takeaway and delivery service. 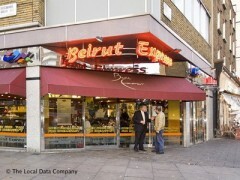 Beirut Express is also part of this chain and serves a variety of sandwiches, snacks and beverages.